What is the biblical definition of faith? Exactly what kind of faith do we need to please God — to live the obedient, overcoming Christian life outlined in the Bible and be born as glorified children of God in His great ruling Family? First, we must understand that this faith is not the power of positive thinking — trying to improve and overcome by just thinking positive thoughts. Many people also make the mistake of confusing faith with emotions. They try to work up faith, which to them means an emotional feeling. These feelings are not the evidence of having real faith. They are in the class of what can be seen, heard, tasted, smelled or felt — in other words, they're of the flesh. Real faith is a spiritual matter, not physical. Let's understand God's definition of the kind of faith required for salvation. 1. Are Christians to "walk" — live their lives — by faith? II Cor. 5:7, Rom. 1:17. 2. Should they seek and look forward to obtaining promises and rewards that are not seen? Col. 3:1-2. Did Paul elsewhere verify that Christians seek after the real, but unseen, eternal rewards and promises of God? II Cor. 4:18. Faith is the substance — more accurately the assurance or confidence — "of things hoped for." Before you receive what you hope for, you already have it in substance, and that substance — that assurance or confidence that you shall possess it — is faith. Faith is your evidence that you shall have what you do not yet see. This faith is based on the sure promises of God, which are recorded in the Bible. 4. Is it possible to please God without real faith? Verse 6. 5. Must obedience to God accompany one's faith in order to make it alive and acceptable to God? Rom. 3:31, Jas. 2:14-26. Many professing Christians have a dead faith. Faith to them is merely belief in Christ's existence and His sacrifice for the sins of mankind. They do not understand that there is something God requires them to do to make their faith alive and active. Traditional Christianity believes that Jesus lived a good life for us — that He obeyed God's law in our stead. However, the Bible makes it crystal clear that having faith does not excuse us from spiritual obedience to God. This is a great mystery to those who don't understand. Since God requires us to follow His law of love — His way of life as spelled out by the Ten Commandments — to be saved (Matt. 19:16-19), yet we are utterly unable to do so of ourselves, it is natural to conclude that God sent Jesus to obey Him for us and thereby excuse us from obedience to God. Nothing could be further from the truth! Noah had a trust and confidence that the invisible God would perform what He had promised. And he proved his faith by his works. Faith and obedience went hand in hand to produce living faith. 8. Did God find Abraham to be "faithful" — full of faith? Neh. 9:7-8. Did Abraham have living faith? Gen. 26:5, Heb. 11:8-10, Jas. 2:21-24. Abraham proved his faith by his works. Therefore God promised to greatly bless him and his descendants (Gen. 22:15-18). Abraham is an outstanding example of the kind of faithful obedience God requires of all Christians. One of the most thrilling examples of living faith is that of Daniel's three young friends, Shadrach, Meshach and Abed-Nego. Recall that Nebuchadnezzar, king of Babylon, had erected a great golden image and ordered everyone to worship this idol at certain designated times. Those who refused were to be thrown alive into a fiery furnace (Dan. 3:3-6). 9. What did Nebuchadnezzar do when Shadrach, Meshach and Abed-Nego informed him that they would not worship his golden idol? Verses 19-23. What would you have done had you been in their shoes? Would you have said, "Well, I have no choice but to bow down to this image — I have to do it or be killed"? Or perhaps you might have excused yourself thus: "I don't think God would be fair if He punished me for bowing down before this idol when He knows I'm forced to do it." Yes, it's easy to use human reasoning to excuse disobedience to God. But God isn't looking for chances to punish us, but rather for opportunities to save us through faith in His power. These three young men knew that "we ought to obey God rather than men" (Acts 5:29). By faith they knew that God makes it possible for us to obey Him. This is an astounding example of living faith — a faith that trusted God to make it possible to obey His law. God tells us through Paul that He will never test us beyond what we are able to bear (I Cor. 10:13). Yet it would seem that if anybody ever came close to the breaking point, these men did! But they didn't reach a breaking point in this trial because they had absolute faith in God. And the God they faithfully obeyed did intervene to save them! 11. 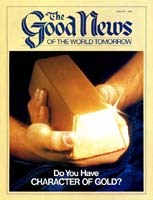 Is the faith through which we are to please God and receive salvation a gift from God? Eph. 2:8. Is this faith an attribute of the Holy Spirit that all true Christians must possess? Gal. 5:22. Whose faith, in reality, is it? Rev. 14:12. In Revelation 14:12 is a description of the true Church of this day. Those in this Church have the faith of Jesus. It is not just their faith in Him, but His faith placed in them and acting in them! 12. Did Paul plainly state that Christ lived in him? Gal. 2:20. How did Christ live in him? Phil. 2:5, Rom. 8:9-10. Jesus Christ dwelt in Paul through the Holy Spirit. And the Spirit of God from Christ implanted in Paul's mind the faith of Christ — the same faith that can be in your mind. That faith — the very faith of Jesus Christ — will enable you to live a life of obedience to God as did the apostle Paul and all the righteous men and women of God. If we were able, of ourselves, to supply the faith to obey God, our obedience would be self-righteousness, which to God is but "filthy rags" (Isa. 64:6). Our righteousness must be through the faith of Christ. Yes, Christ's faith, not our own! 13. What must one do to receive the Holy Spirit and very faith of Jesus Christ? Acts 2:38. Must one be willing to obey God? Acts 5:32. And must you first show faith toward Christ before you can receive His faith? Acts 20:21, Rom. 1:17. God will give His Holy Spirit and the resulting faith of Christ only to those who meet these prior conditions. Yes, it does take our own faith to believe in the sacrifice of Jesus Christ for our sins. But that faith doesn't save us! It is only when the Holy Spirit comes into us that we receive the saving faith of Christ! And it all comes as a free gift from God. We could never earn it. Jesus is the source of living, active, dynamic faith. And if Christ is in us through His Spirit, He imparts His own faith to us, which makes our spiritual obedience and ultimate salvation possible.